Foilborne: Leaving on a jet plane..
Well I had my Mach 2 in the country for a whole week before shipping it off to the USA! In typical Weymouth fashion we had gales all week, and although stuck ashore for many days, I did get out three times. At least I got some windy weather sailing in before the Gorge – but saying that I apologise now to everybody if it is now light winds! Although not intentional, I think I may end up being the ultimate test for the Mach 2 aim of being able to deliver a competitive boat straight out of the box! Some have been worried about the reliability of the mach 2’s but I was impressed with the quality from opening the box. I’ve only had to do two mods – one was to add a May stick, and the other was to replace a welded part within the wand system that was the cause of many people’s problems at the Euros. The boat even came with all the splicing done, which was the bit I was looking fwd to doing with a new boat! I replaced the control lines for some Marlow Excel racing, and used pretty much everything else that came with it. I got two days of getting used to the boat, and then a constructive sail against Alex Adams where I was just able to do some proper line ups and confirm my angles and speeds a bit. I actually feel quite settled in the boat, and looking forward to the Worlds, but I really must stop the last minute prep each year! At least Dubai next year is outside of the main sailing season so I might have time to do more of my own sailing instead of time in a rib. So it is over to Simon’s place tonight, and then the four of us flying out (Simon Payne, James Phare, Andrew Friend, and myself) leave from Gatwick on Sunday morning. 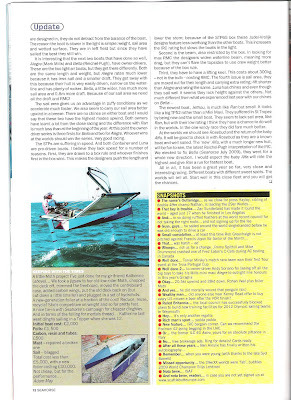 In other news, Katherine and Carbon Footprint have made it into Seahorse magazine this month.